A hearing on the Tuna Canyon Detention Station lawsuit, scheduled for Nov. 6 in Los Angeles County Superior Court, has been postponed. The goal of the lawsuit is to have the City of Los Angeles rescind the historic-cultural landmark status it gave to the Tuna Canyon site in Tujunga last year. The property owner, Snowball West Investments, says that it recognizes the historical significance of the camp where Japanese, German and Italian immigrants were detained during World War II, but that landmark status would impose restrictions on development. The case was originally scheduled to be heard by Judge Luis Lavin, but was reassigned to Judge Robert O’Brien. “The other side challenged this judge … so the case is being reassigned and they’ll put it into another court that does the same kind of writs and receivers,” explained Greg Culling, an attorney for the Tuna Canyon Detention Station Coalition, which heard the news upon arriving at the courtroom. The case will not be heard until next year. Fred Gaines, attorney for Snowball, said that a trial-setting Conference has been scheduled for Jan. 23, 2015. The coalition — made up of descendants of detainees, civil rights activists, educators and local residents — is not a party to the lawsuit but has filed briefs in support of the city’s decision and plans to send representatives to the hearing, though they will not be allowed to speak. The lawsuit points out that the site, now occupied by the Verdugo Hills Golf Course, does not contain any structures from the detention station, but the coalition says that does not diminish the site’s historical importance. The City Council gave landmark status to an acre of land containing groves of trees that date back to the 1940s. Snowball says that it is willing to commemorate Tuna Canyon, but that the designated area would be within a gated community that is to be built after the golf course is demolished. 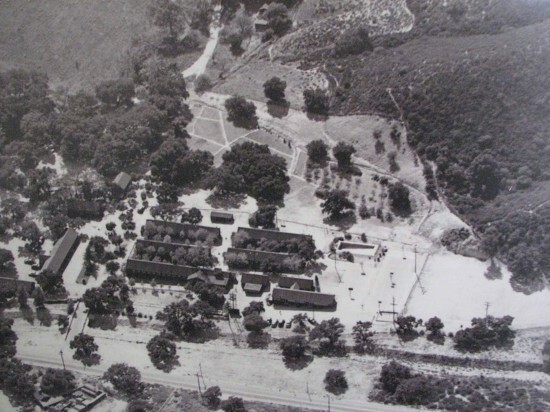 The coalition says that Tuna Canyon, as a wartime confinement site located within the City of Los Angeles, provides a unique opportunity to educate the public about a little-known part of local history and the importance of protecting civil liberties. An aerial view of the Tuna Canyon Detention Station was displayed at the June 11, 2013 meeting of the Los Angeles City Council’s Planning and Land Use Management Committee.